Open air or outside stairs, stairs to decks. 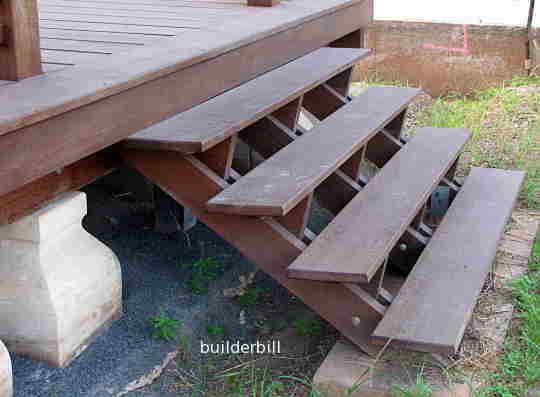 Deck Stairs - A simple to build but very pleasing all timber stair to a low level deck. In the photo above because of the height being less than 1M. no handrails are needed which simplifies the construction. All stairs have to comply with the various building codes as does any stair, in addition there are a few extra requirements for a stair that is outside and exposed to the weather. Outside stairs have to be durable. They are exposed to the weather and so they have to have extra attention paid to their construction. The stair above is built with a very durable hardwood timber that by it's nature gives it an expected lifespan of a few years longer than any softwood. All the timber members should be oiled with a good quality decking oil a few times before final assembly. That is after they have been cut to length and trimmed up. Particular attention should be paid to the end grain that soaks up a lot of oil. 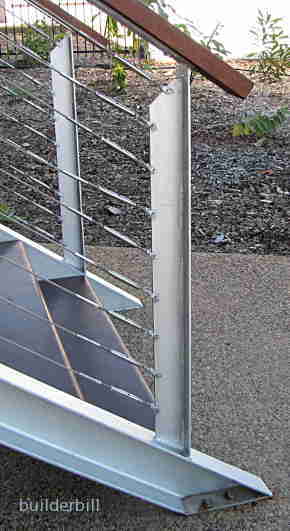 Note the use of galvanised bolts. Also but not seen too well in the photo, the carriages are bolted to galvanised steel brackets which in turn are bolted to the concrete. Timber does not get set into concrete. 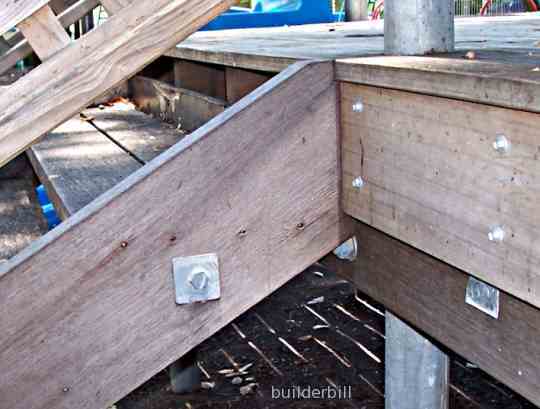 Deck Stairs - When the gap between the treads in an open stair is wider than the regulations state (the Australian BCA states 125mm) then we have to use something to reduce the gap. Here is a nice example of doing just that. 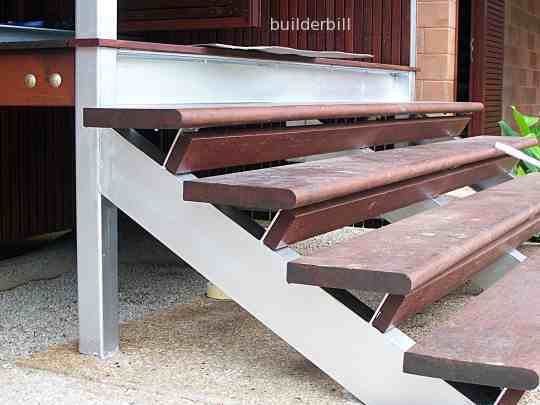 Even though steel is clearly the material of choice for the structural members in outdoor stairs, for good all weather non slip properties, the look and feel of timber makes it a good medium priced choice for the treads. Once again oiled well before fixing, with galvanised bolts. Apart from the top photo all the stairs on this page have steel newel posts, for strength,durability and design freedom. At the right is the bottom of a stair to high level deck on a half a million dollar house. No doubt the builder and quite possibly the owners are quite pleased with it. From my point of view an entry stair should be as good as it is possible to do with the materials selected. Even a casual observer can see that the newel post are not parallel. Either one of them or possibly both are out of plumb. Even though the lump of 75 x 50 timber as a handrail capping is probably to the design one would think that the carpenter that fixed it would have been told to run at least a pencil round on all the edges. It is a hand rail after all. Continuing the channel stringer past the last nosing line is just bad design or lazy construction. It could easily be tripped over and it's ugly to boot. The green steel stair on the right may not be a sparking example of stair design but even so the steel string is mitered into a vertical section which is how it should be. Below are a couple of shots of another budget priced stair built about twenty years ago for a small outside deck. It has not had any attention since. It was well oiled when it was built , but I tend to put the lack of any real deterioration of the timber down to the fact that I used a Malaysian hardwood called Keruing, which is a very resinous timber. I took the precaution of putting a galvanised bolt tying the strings together under every second tread. This is a great way of stiffening up a stair like this if the look of it is no problem. It is also very cheap and quick to do, using in this case standard 3M. lengths of threaded rod cut to length on the job. 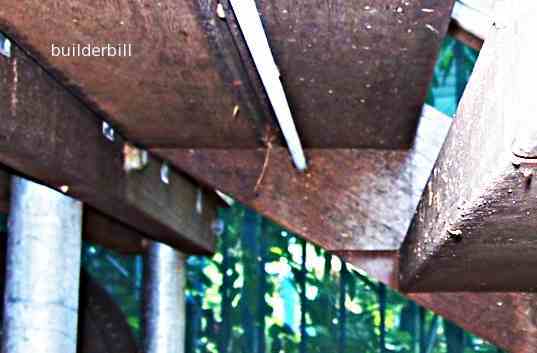 Deck Stairs - Timber stairs to a deck about shoulder height. Galvanised steel pipe supports set in concrete foundations. All bolts, nail plate connectors and fixing were galvanised. 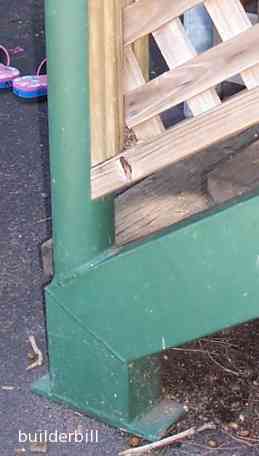 Deck Stairs - The same stair showing the bolt under the tread.